The unique yet classic shape of arabesque tile provides many beautiful designs. It will give you many backsplash ideas for your kitchen or bathroom. The scrolls of the arabesque shape provide a lovely pattern. 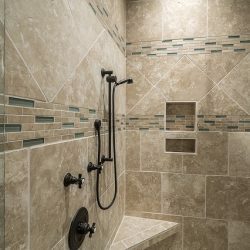 They can be enhanced with different tile and grout colors. The shape of this tile is a traditional one. 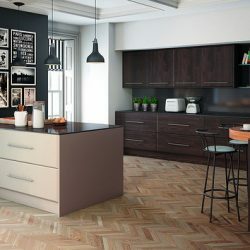 As a tile design, it is a modern concept. It takes a step away from the typical square or subway shaped tile in your Queens or Brooklyn kitchen. The curved shapes of arabesque tiles put the emphasis on the grout lines. When setting arabesque tile, it is very important that each grout line is perfectly spaced. This way, the intricate pattern will have a uniform look. The installation of arabesque tile is not an easy project for an amateur installer in Manhattan. It is best to have it installed by an experienced professional. This way you will get an excellent end result. Dove gray arabesque tile for the kitchen backsplash provides a soft, elegant look. This look is interesting and subtle. As a contemporary color choice, gray provides a soothing, modern look. Paired with the sophisticated shape of dove gray arabesque tile, the overall look is unique. 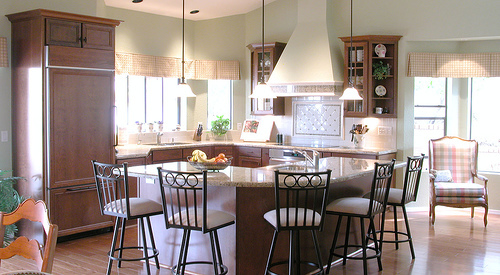 It provides an attractive backdrop for cabinets and countertops. It comes in complementary or contrasting colors. Carefully matching the grout with the same dove gray arabesque color will give your backsplash a smooth, uniform look. 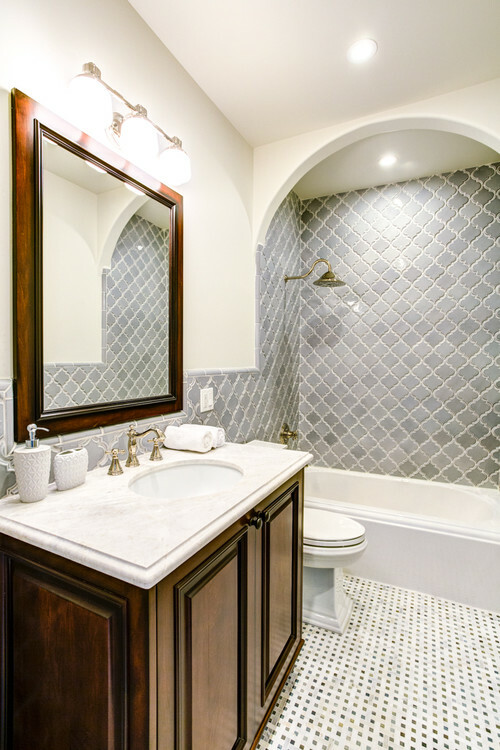 Antique white arabesque tile creates a clean and classic look. With it, an unexpected pattern comes. 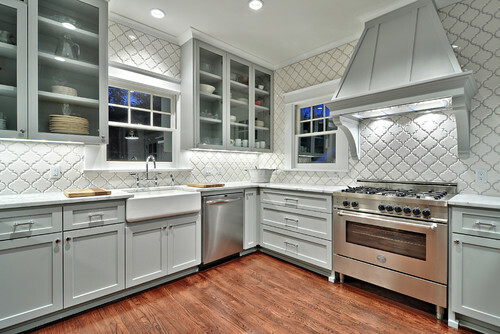 From a distance, antique white arabesque tile has the look of subway tile. On closer inspection, the curved grout lines form a detailed and distinctive design. The shape of antique white arabesque tile can easily be accentuated. Use a contrasting color of grout to put more emphasis on the shape of the tile. Choosing a multi-colored arabesque tile backsplash allows more opportunity to create unusual and interesting patterns. By alternating antique white arabesque tile with dove gray arabesque tile, a subtle diagonal, horizontal or vertical pattern can be achieved. Arabesque tile colors with a marked contrast can create a pattern. This pattern could be overwhelming for a small backsplash. For best results, choose two colors that complement each other. This is how you’ll get a sophisticated effect. You can create patterns in different ways. Choose a mix of matte and glossy tiles for your arabesque tile backsplash. The subtlety of tile in the same color with a different finish gives you the ability to create patterns. These patterns will glow. They will change with the light in your Brooklyn home. Ambient lighting can be selected to make the most of this look. It will emphasize the sparkle of the glossy tiles contrasted with the simple grace of the matte tile pattern. Using grout colors to change the look or intensity of the pattern can be a fun way to emphasize the unique look of your arabesque tile backsplash. However, it is easy to overdo what should be a subtle effect. Arabesque tile creates a busy, ornate pattern. Dark grout may create a look that is too bold. Darkening the color of the grout should take place in small increments. A test of the final look before committing to grouting the entire backsplash is wise. It is difficult to remove grout or lighten the color of it once it is in place. The beauty of arabesque tile gives you an opportunity to add interest to your kitchen or bathroom backsplash. The unexpected shape of this intricately curved tile adds an eye-catching pattern to your backsplash and your home’s decor. Call us or visit us and let our professional staff help you choose the perfect arabesque tile backsplash for your home.